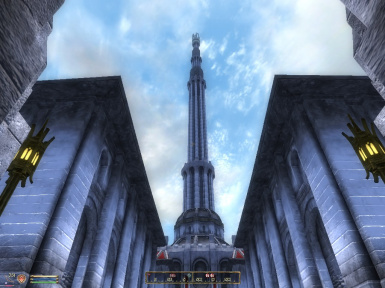 A perpetually developed mod intending to more than triple the size of the Oblivion's Imperial City. Updated 11.16.11 Small fixes in and around the Waterfront, Pelinal Place, and the Legion HQ. 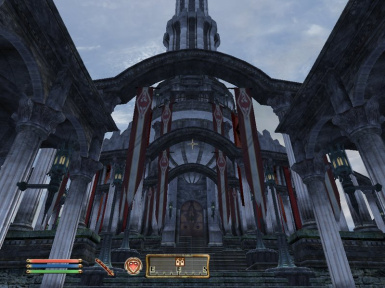 I like to think that I speak for everyone when I say that the Imperial City, as presented to us on that fateful day in 2006, was a disappointment. 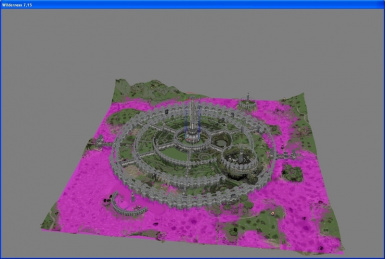 And wow, Bethesda, I was disappoint. 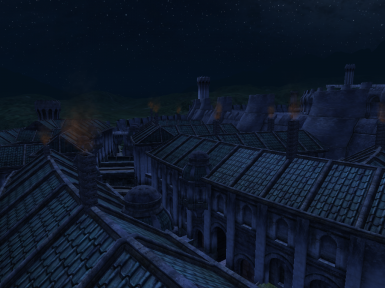 There were six districts, plus a prison, the Arcane University, the waterfront, and a dank, lackluster palace. 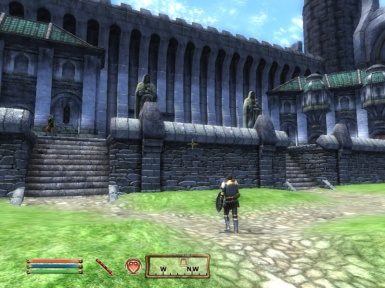 We all visited the Arena, did a few quests in the city, took the Market District for all it was worth after every dungeon-adventure, and then pretty much forgot about most of the city. Five dollars, by the way, to anyone who explored the sewers. 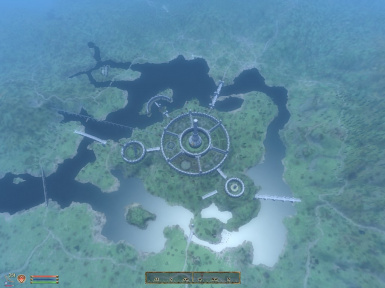 In my hunger for a better capitol for a continent-spanning empire, I for one followed certain mods with great excitement, such as Imperial City Reborn or ImpeREAL. The former died a stillbirth and the latter only improved the way the place looked without adding any quests or characters to the place, and cosmetics just aren't enough for me. 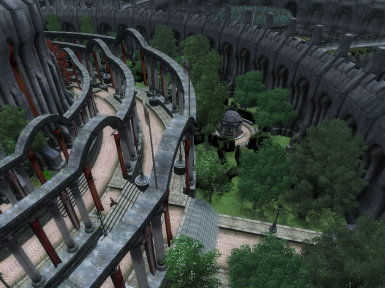 So, I began to work on my own version of the Imperial City, a city that wouldn't disappoint me. 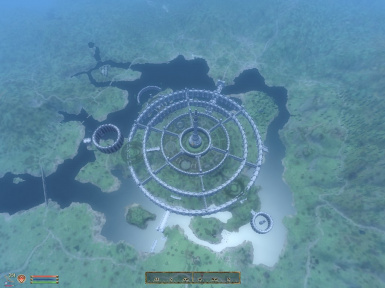 I wanted to add features that most cities should have, as well as enough houses and streets to actually be considered a city, rather than a giant, circular, stone village. 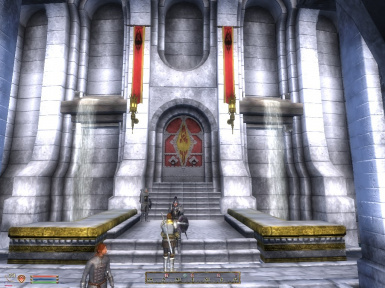 This mod brings the total number of districts up to an impressive 22, adds hundreds of NPCs, and will bring a new batch of quests, and enough to keep anyone entertained for a long while. Quests. Lots of quests. And dialogue. That is important, too. I bet a lot of people don’t even know what that word means. This district could be described as a suburban neighborhood transplanted into the heart of a city. 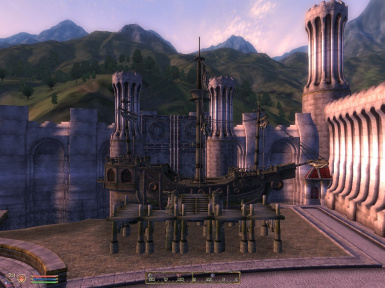 This district boasts the finest hotel and restaurant in the entire city, travelers from all over a Tamriel stay there, some visit the city just for an excuse to stay there. Besides the hotel, this district is known for certain colorful residents and its magnificent miniature park that's almost big enough for you to forget you're surrounded by a city. But not quite. This district was recently renamed in an attempt to brighten the lives of those living there. City planners had hoped that the pious, comforting name would help people understand just how much their city truly cared for them. Instead it just added another layer of cynicism to the already down-and-out residents of the district. 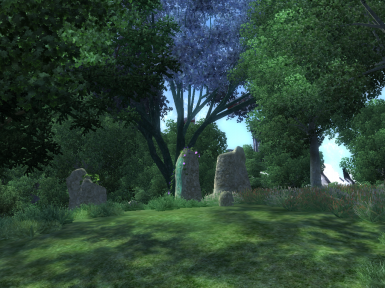 Because surely, if they were in Akatosh's own arms living in this place, Akatosh was giving them all a collective noogie. 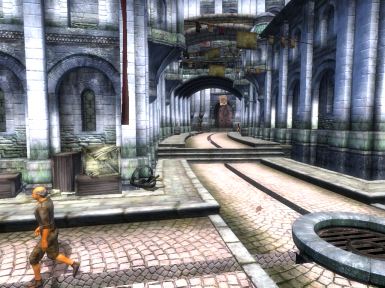 This district is the poorest one still within city walls, boasting a beautiful open sewer, grimy walls and streets, and the highest level of poverty in Cyrodiil. Think of this district like a fraternity row, except with embassies. And instead of idiots with sideways caps and popped collars you have lesser politicians from the provinces and where frats have Frisbee you have Imperial politics such as tariffs and land usage. Almost as good, right? 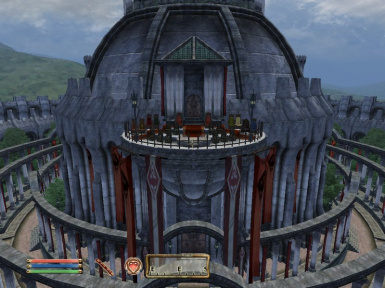 This is where a majority of the Elder Council is staying during the Oblivion Crisis since the Council must be ready to go into session at a moment's notice. 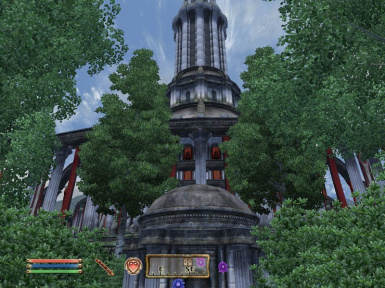 One noteworthy building is a temple near the Morrowind building for the pious Dark Elf dignitaries to worship. I know, it surprised me as well that "forum" also means a place for people to converge, important announcements to be made, and for people to hit "dislike" on everything they see relax. 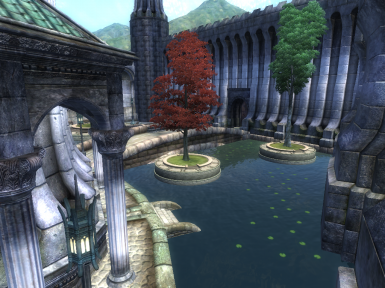 This district was my way of living up to the lore, calling the Imperial City a city on the water. 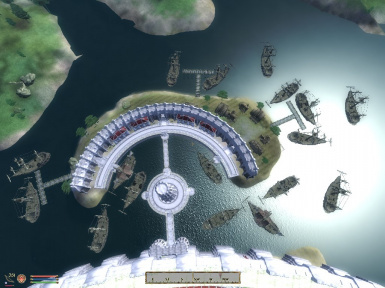 The entire district is one large reflecting pool with artificial island connected by bridges. This is one of the nicest spots in the city, expect to meet many people here. 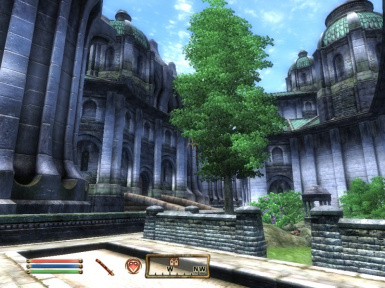 This district is an example of what the city looked like in its older, unplanned stated. The complicated high-rising buildings feel like they're suffocating you, and that if you don't leave soon the whole world will collapse on you. Strange then that this district has the highest population density in the city, the people live there packed in like sardines. 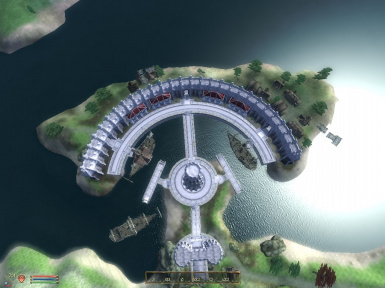 This district also is the home of the Imperial Museum of History, specializing in all manner of ancient artifacts both naturally made or constructed. Currently the focus of their exhibit are the ancient Ayleids, and why their cities seemed to consist entirely of subterranean trap-filled corridors. I truly am a fan of ironic district names, they make it all the more surprising when I tell the truth. Innocence Gardens is derided by pilgrims, the morally uptright, and all men in front of their wives for being the location of the city's infamous brothel. The brothel has recently fought off rumors that their employees were strong-armed into working there or that they were in some way being imprisoned there. It is hardly surprising that these accusations did not go anywhere, both because the pimp is a known friend of more than a few nobles and because the one who first levelled the accusations is currently under the impression that he is a beautiful Orc maiden. For such a large and powerful government, there definitely seems to be a lack of stonecutters, construction workers, or imports to speak of. 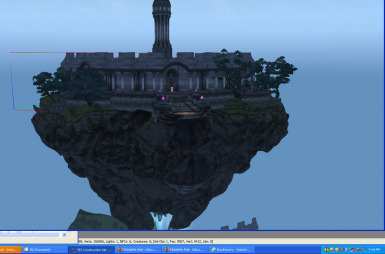 Now, one could say that this all takes place off-screen, mages go and "magic" it to appear, or that "it's only a video game, UCM, stop caring so much and go out and make friends." But I say it's important for immersion. Definitely important, so I made this district. 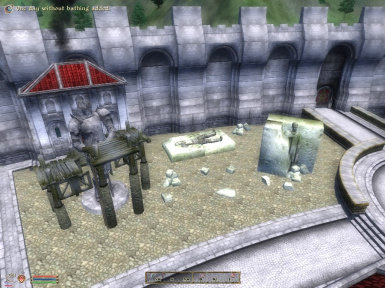 The old Palace was a pitiful site. It was dark, dank and was inhabited by guards, two regular people, and a handful of blind monks. It also confused me that the guards talked to me inside the palace as if tourists regularly visited the palace, even though I was the only non-employee in the building. Not anymore. The palace now is brightly lit and carpeted to encourage the kind of foot-traffic the guards imply they have. The council meets weekly, and the second floor has been turned from an observation deck into the Emperor's missing throne. Below the council chambers are store rooms (off limits, logically enough) and the shrine where the Eternal Champion slew Jagar Tharn. 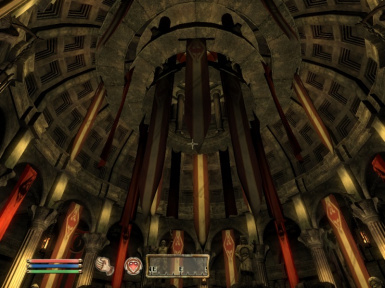 Beneath even that are the Septim crypts for the royal family to be laid to rest. Both of these areas are permitted for tourists to visit, and is in fact encouraged for those touring the palace for religious reasons. 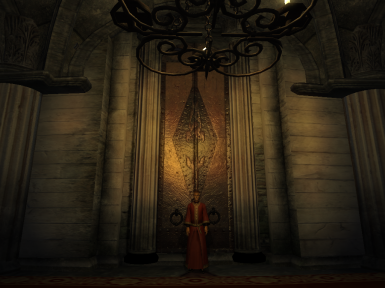 Above the throne room, I will be silent, but it is no longer guard after guard after guard with a few monks in between. 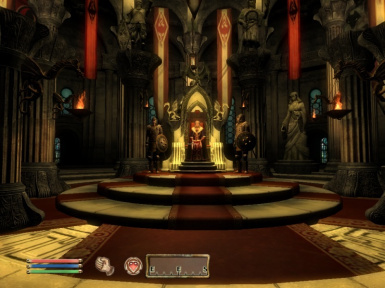 The palace is now staffed with servants, foreign dignitaries stay in the luxurious guest quarters, and at the top is Uriel Septim's own (now unused) chamber. One of the most ritzy districts in the city, only the rich and people with something to prove manage to live here. This district is proud to call the famous Pelinal Statue their own, and it fits them. Nothing defines the well-to-do like stomping on a defeated opponent. Besides the statue this district contains the even more famous Hogithum Hall. 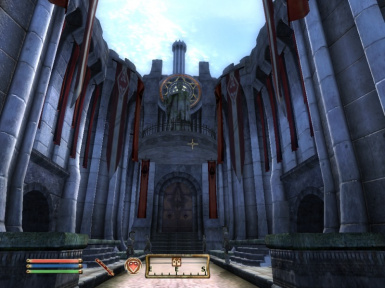 This court house saw the only known trial of a divine being, and the subsequent banishment of a Daedric Prince. 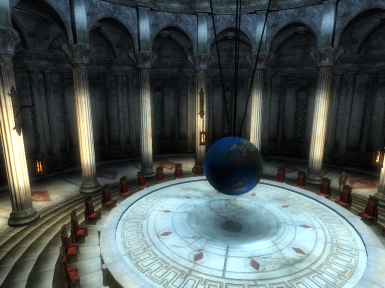 The Hall is overseen by Judge Rodell, the highest judicial authority in the Empire. The main thoroughfare into the city. This road is essentially a large park intended to impress diplomats and commoners alike. It is adorned with several statues, trees, miniature hedge-paths, and well-armed ceremonial guards. This district is kept rigorously cleaned, so do not leave anything there for long that you hope to pick back up later such as an item, money, or a body. The Empire is reputably the center for commerce, culture, and all manner of bizarre customs to meet. Why, then, is the only source of entertainment for the city dwellers the Arena? Sure, it's very nice to watch people being gutted and then possibly winning money on it, but couldn't it also be satisfying to watch characters pour their souls into a performance and watch lovers split, kingdoms collapse, and true love blossom? Also, it's pretty entertaining when they flub their lines. 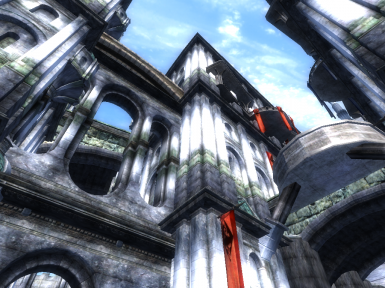 Many of the custom meshes in the mod were provided by him out of the kindness of his heart. Who else but he would offer to make interiors for a total stranger? I don’t know, but those people are always cool in my book. And since he made half a dozen or so, he's six times as cool as most people. He probably remembers me like a royal maiden remembers a thief in the night. “That jerk came in, got me all excited, took my stuff, and disappeared. Good riddance!” But I'm back, after dealing with things, arranging a funeral or three, and settling some disputes! FrenchNinja provided a series of new books and assorted writing throughout the city. Every one of these fine modders for their resources that they kindly lend to the public that I lapped up like a hungry kid in a candy store. Due to the long production time and numerous resources used, I may have forgotten someone. If so, I sincerely apologize. Just send me a message and I’ll correct it right away, no theft is intended. 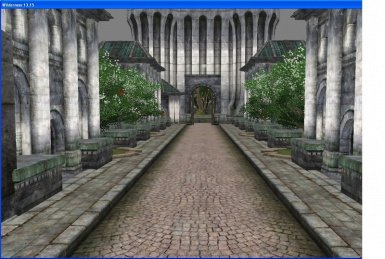 Install “Imperial City Redux 1.esp” into your Data folder, anywhere will do. Now, the tricky part. Take the tectures folder in the RAR, open it, copy everything in there. 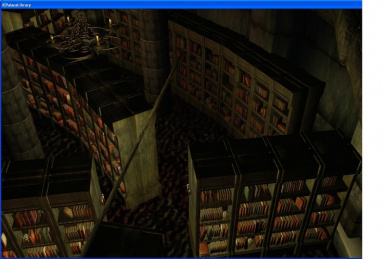 Then go to the textures folder in your Data folder and hit paste. Have it merge things as best it can. Nothing should overlap, it should just merge any folders with the same names, like “Architecture”. After that, find the ICredux folder in the RAR’s meshes and copy it to your meshes. And it should be done. I apologize, since I used so many resources I would have put things into BSAs, but I seem to have horrible luck with those. I’m sorry, I don’t know how to computer. I gladly welcome offers to assist, recommendations, suggestions, problems, or first born children.